In order for your long jump runway surface to be in the best condition possible for high safety and performance standards, it is essential to keep it well maintained with a specifically designed cleaning and maintenance schedule. Putting a regular maintenance programme into place will ensure that there is minimal damage and wearing to the long jump run-up surface and therefore this makes the long jump surfacing more cost effective and schools and clubs can save on the cost of repairs or long jump resurfacing. We’d be happy to provide you with more information on this equipment as well as the athletics facilities they are used for. Just get in touch with us using the contact box on this page and we’ll be able to send you some product sheets. Most athletics surfacing contractors and specialists in the UK will be able to provide specialised sports surface maintenance equipment along with the actual installation of the long jump runway flooring and sand pit. One of the most commonly used pieces of equipment for maintaining a long jump surface is a specially designed sandpit rake, but hang on, couldn’t you just use an ordinary garden rake instead? Well no, actually you can’t, if you want to keep your long jump surface in great condition to ensure the safety of its users and provide the best possible performance qualities for those taking part in the sport, you need to use the correct maintenance equipment. Plastic sandpit rakes are designed specifically for use on long jump pits; the fibreglass rake handle provides excellent grip and the extra wide head ensures even distribution of sand across the landing pit to allow a steady surface to land on, this therefore helps to prevent injuries. The wide head also means that the sandpit rake can reach across the entire landing surface so no area is missed, as well as clearing away weeds and debris which could contaminate the long jump sandpit. These specialised long jump sand pit rakes are a vital piece of equipment for the maintenance of long jump surfaces at schools, colleges, leisure centres and athletics clubs across the UK, they ensure that the surface is safe especially if kids are using it, and that it provides good performance characteristics for more professional athletes. Long jump runways and sandpits can be constructed to different dimensions and specifications and to suit a variety of budgets, and we can also supply sandpit rakes and other athletics maintenance equipment in addition to installing the long jump surfacing itself. 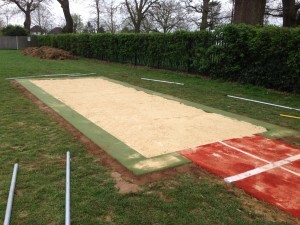 Please visit www.sportsandsafetysurfaces.co.uk or use our contact form where our friendly staff will be more than happy to discuss prices and offer quotes to suit your individual long jump specification, as well as advise you on the maintenance equipment you may require. Please share this article and let us know your thoughts on this topic by leaving your comments below, thank you!